Just like Chew I am looking to squash to calm work frazzled nerves (you can even use the leftover squash from her tomatillo recipe here). My last couple of weeks have been so filled with torment (i.e. too much work) that cooking has practically been wiped off the radar. It's a real shame. Super long work days leave no time for proper shopping but then when I do drag my withered self back into the flat, I crave something healthy, comforting, tasty and home made. If any of you want to share your fast cooking fall backs, I'd love to hear them. 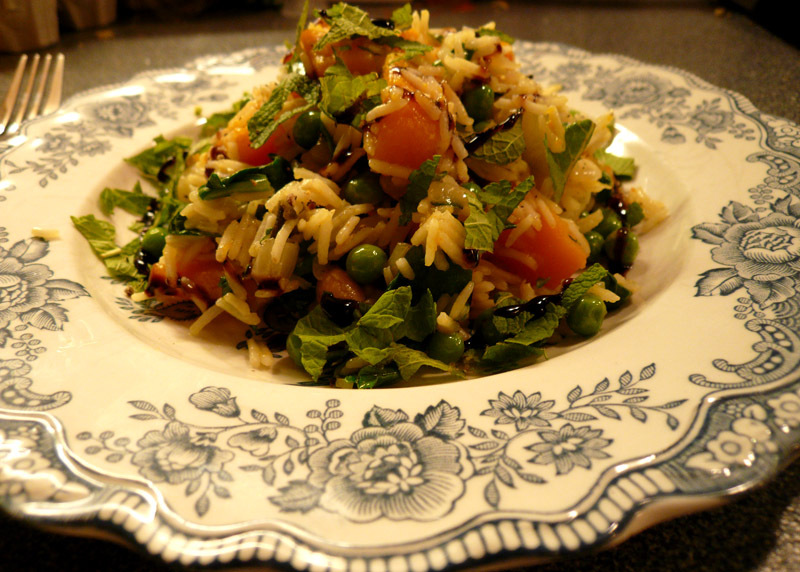 In the meantime, hooray for pilaf! 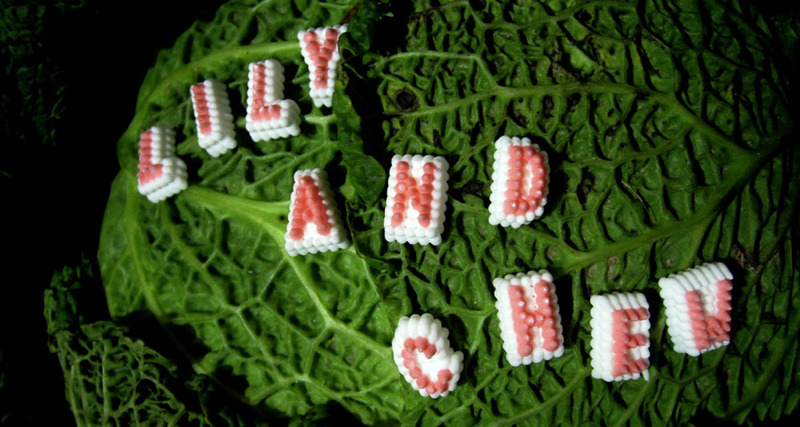 It is easy, tastes just as good on day two and can use any vegetable floating in the fridge. It is also a great leftovers lunch for desk slaves. As for squash, they are so flavoursome right now and their sweet, warm, sunny gooeyness is reassuring in times of low morale. 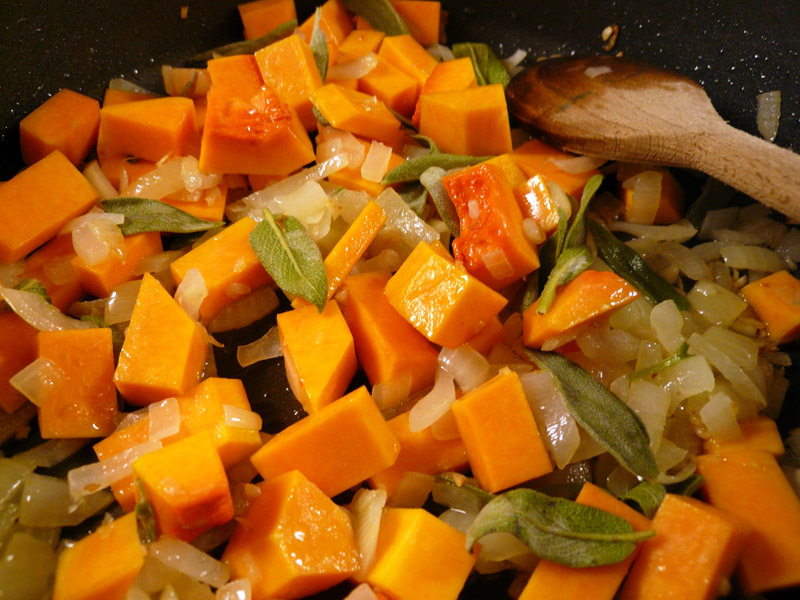 Gently fry your onion in olive oil until soft, then add the squash and fresh sage leaves. You want to get the squash to give in and break up a little (you can cook with a lid on if it helps). If the pan is drying out, add a splash of wine or water or stock. Squash is great in a pilaf because it disperses so well, sticking to the rice and making every forkful sweet and full of flavour. When the squash has softened, add your rice and toss it until coated. Add the bay leaf and veggie stock and bring to the boil. Then reduce the heat and simmer with a tight fitting lid for about 15 minutes. (Resist the temptation to lift the lid for a peek because you'll upset the whole steamy process.) In the last couple of minutes, add the spinach and peas before shutting the lid again. Then let the pilaf cook off the heat for another 5 minutes. Once on the plate, top with torn mint leaves and a drizzle of balsamic glaze if you want. To counter the forlorn self pity that can accompany the over tired and over worked, the pilaf rice-plumping minutes give you enough time to wash your face, get into your jim jams and select a program on the BBC iPlayer (the squirrel's nuts for those of us without a tele). I watched a brilliantly made Storyville documentary (All White in Barking) that had me glued to the screen. It was just the ticket for taking my mind off the day's crud and providing a little something outside my own world to ponder. Even if it's the wrong side of 11pm when you settle down, if you can't have a tasty dinner in front of the tube at the end of a long day, it's all too easy for the 'work, eat, sleep, repeat' model of living to become far too depressing to bear.